What does your mind see imagine when you think of rain? A soft Spring shower in a grove of trees? A Summer thunderstorm pelting the pavement? A raging typhoon? Seth Cluett imagines the potential for all of these coexisting in a single drop. “My Own Thousand Shatterings” is his homage to rain in three pieces. In its sequencing, it unfolds in a reverse chronology. 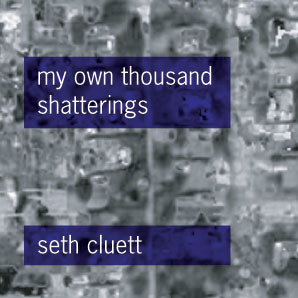 The third piece is a field recording of rain, the second a stereo recording of a performance in which all of the sounds were extracted from the third piece by playing it back in the resonance of Cluett’s home, and the first is a mono studio recording using the same sources as the second. In the first two pieces, the extracted tones are varied at a glacial pace (Cluett has remarked that his pacing of the second piece was in fact inspired by a glacial movement in Pakistan) to produce a shifting landscape reminiscent of torrential sheets of rain. Cluett’s works are often reproduced or performed as part of an installation where he can tune the tones he works with to the resonant frequencies of the space. As such, there is a physical aspect to his work that one would not expect to translate to a static recording. However, his use of his own house as a chamber enables him to transcend this limitation of the medium. The tones that he coaxes of the noise of the rain become an acoustic analog to the condensation of raindrops from vapor. At times one hears a shuddering buzzing overtone as parts of Cluett’s house threaten collapse. The gut loosening bottom end rivals Sunn O)))’s liquefaction factor. Whether taken in its “natural” form or reduced to its elements, Cluett clearly views rain as a hugely unsettling and disruptive force of nature.